Place 1 cup of the lentils in a large bowl and thoroughly mash with a potato masher, bottom of a mug, or fork. Stir in remaining ½ cup whole lentils and next 9 burger ingredients (carrots through black pepper); mix well until conhesive. Divide and shape lentil mixture into 4 patties. Heat oil in a large skillet over medium-high heat. Cook burger patties until golden brown, about 3 to 4 minutes on each side. Combine all Tahini Slaw ingredients in a large bowl; mix well. Place one lentil burger on each of 4 buns. (If desired, spread an extra layer of tahini on bottom half of bun to help adhere patty to bun.) 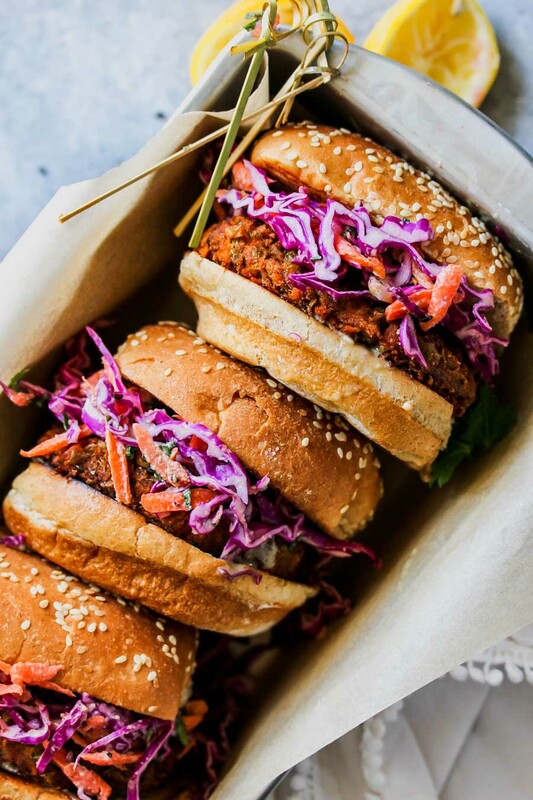 Top lentil patties with slaw.